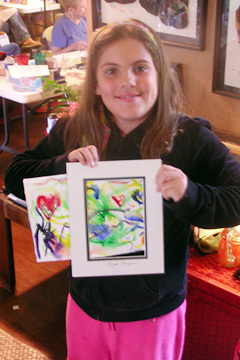 Tori Life's watercolor, above, is among the works showing at Bethel Street Gallery's "Painting for Peggy" art sale, a fundraiser for artist Peggy Chun. Bethel Street Gallery is opening a special show at this month's First Friday event, and is hoping art patrons will come out Friday to make purchases. "Painting for Peggy," running through May 18, is a fundraiser for artist Peggy Chun, who has amyotrophic lateral sclerosis (ALS), also known as Lou Gehrig's disease. The gallery is exhibiting for sale some 100 watercolors by Chun's fellow artists and friends; proceeds will help ease her mounting medical expenses. Bethel Street Gallery is offering to donate 10 percent from any sales during First Friday. 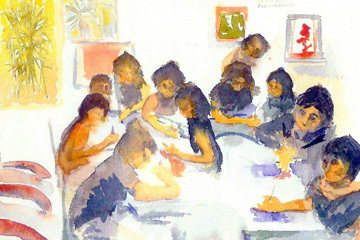 The paintings were produced during a six-week painting class by Chun at her Nuuanu studio. Chun's own work, and an appearance by the artist herself, will highlight the opening. The "Painting for Peggy" exhibit is showing at 22 Pauahi St. Gallery hours are 10 a.m. to 6 p.m. Mondays to Fridays and 10 a.m. to 3 p.m. Saturdays. Call 524-3552. » Daspace, 1192 Smith St., second floor (351-4960): Create leis for Mother's Day with recycled materials. » The Exhibit Space at 1132 Bishop Street (599-5009): Closing night for the Windward Artists Guild Juried Spring Exhibition. Kapiolani Community College art professor Carl Jennings won best in show. Paintings, photography, blown glass, sculpture, ceramics and mixed media, juried by Allyn Bromley and Marcia Morse, are displayed. » Hawaii State Art Museum, 250 S. Hotel St. (586-0900): Continuing exhibit on Art in Public Places through Sept. 3. Also, Cinco de Mayo celebrations feature hot salsa band Sabor, and food and margaritas by Compadres. The show features works by artists young and old who learned watercolor painting at Chun's studio. » The ARTS at Marks Garage, 1159 Nuuanu Ave. (521-2903): Hawaii Craftsmen present "Fiber Hawaii 2006," a juried show that features the topic of fiber or fiber techniques in all media. Sculptors, for instance, who traditionally are not considered fiber artists, participate with works in ceramics, metal and glass. Retiring UH professor Pat Hickman juried this year's show. » Other participants include: Pegge Hopper Gallery, 1164 Nuuanu Ave.; The Cathedral Gallery, 1184 Bishop St.; The Contemporary Museum at First Hawaiian Center, 999 Bishop St.; The Art Board, 1170 Nuuanu Ave., # 104; Details Gallery, 1142 Bethel St.; Café Che Pasta, 1001 Bishop St.; Got Art? 1136 Nuuanu Ave.; Hanks Café Honolulu, 1038 Nuuanu Ave.; INTO, 40 N. Hotel St.; Jeff Chang Pottery, 808 Fort Street Mall; Jo Fraticelli's Nesting House, 1151 Bethel St.; Kaimalino Designs, 3 N. Pauahi St.; Pipedreams, 181 N. King St.; Louis Pohl Gallery, 1111 Nuuanu Ave., 521-1812; Mercury, 1154 Fort Street Mall; Nextdoor, 43 N. Hotel St.; One Night Stand in the Chinatown Courtyard, 1126 Smith St.; Pacific Traditions Gallery, 19 North Pauahi St.; Ramsay Museum, 1128 Smith St.; Sharkeys Tattoo, 1138 Nuuanu Ave.; Studio of Roy Venters, 1160 Nuuanu Ave.; thirtyninehotel, 39 Hotel St.; Tea at 1024, 1024 Nuuanu Ave.; New Life Gallery, 1190 Nuuanu Ave.; Toshiko Takaezu Ceramics Studio at the YWCA, 1040 Richards St.; Duc's Bistro, 1188 Maunakea St.; HASR Wine Company, 31 N. Pauahi St.; rRed Elephant, 1144 Bethel St.; Keiki Photography, 1123 Bethel St.; Sourcing Asia, 1133 Bethel St.; and Urban Nomad, 1023 Smith St.